Insider Trading: Is the pressure mounting once again in Edmonton? There's been little talk on the Artemi Panarin contract front since the pending free agent informed the Columbus Blue Jackets during the summer that he wasn't ready to negotiate an extension with the team. According to TSN Hockey Insider Pierre LeBrun, the two sides have left things at that since the season began, but Panarin will update his agent on the situation next month. Panarin is one of two pending unrestricted free agents on the Blue Jackets, along with starting goaltender Sergei Bobrovsky. During the off-season, both Russian stars expressed interest in playing out their current contracts this season. "I wouldn't say much has changed with Bobrovsky, but here is what I would say with Artemi Panarin. His agent Dan Milstein is slated to meet with him in person next month during the holiday break to go over where they are with that contract situation," LeBrun reported Monday on Insider Trading. "They haven't talked business since early September. 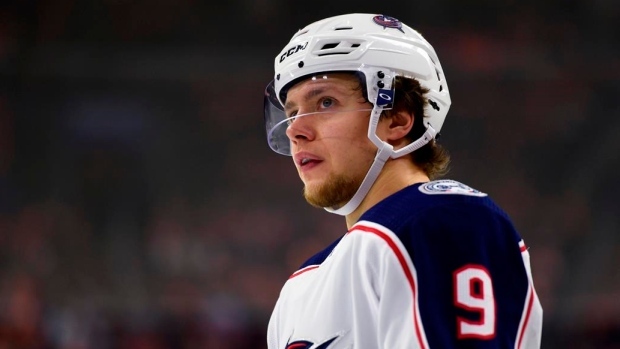 We know this off-season, Panarin said he's not ready to sign an extension with Columbus and probably was headed towards the market on July 1st. Now, has that changed? All I can tell you is this - everyone around him feels that he is a happy person. He's scoring, the team is in first place and that is the greatest asset that the Blue Jackets have right now is to keep showing him that this a good place to be. "In the meantime, I asked Jarmo Kekäläinen on Monday, what if he's still unsigned at the trade deadline? He brought up the example of Jack Johnson, who last year was a pending UFA, the Blue Jackets examined the trade offers on the table and decided they would keep him for the playoffs. They can do the same thing with Panarin or obviously they can move him. "The bottom line is I think they'll make him a contract offer right before the deadline to see if they can convince him to stay." Panarin, 27, is tied with Cam Atkinson for the scoring lead of the Blue Jackets with 22 points in 20 games this season. He ranks first on the team among forwards with 19:30 of average ice time per game. A two-time 30-goal scorer with the Chicago Blackhawks prior to being traded to Columbus in 2017, Panarin is off to a slower start finding the back of the net this season with just five goals to date. He scored 27 goals last season. Panarin debuted at No. 10 on TSN Hockey's first Trade Bait list of the season last month, though Kekalainen said Monday the team has not yet looked into any trade options. During the summer, Milstein said Panarin wasn't holding out to try to make more money on the open market, but that he was simply not ready to commit to staying in the state of Ohio long-term. "He’s not ready to sign. Is he gonna sign? Look at it this way, I don’t even know what they’re going to offer," Milstein told The Athletic. "I’ve read some comments that this is the agent’s work, that we’re holding out to get the most money out of them, but it isn’t. I think they’d give him $11 million if he really wanted it. But I haven’t even discussed anything with them. I’ve seen reports of $9 million to $10 million. You’ve seen the recent signings that are happening. We’re not holding out for more money, because if I called Jarmo [Kekalainen] right now, he’d probably drive up to my house and we’d put a deal together. "[Panarin’s] biggest thing is… he loves the team, he loves the coach. It’s not the team or the way they treat him. It’s about does he want to spend the next eight years in Columbus? That’s the only thing at stake right now. If it was a two-year deal we probably would have done it. But it isn’t a two-year deal. It’s gonna have to be an extended, seven- or eight-year deal put in place." The Blue Jackets dropped to 12-7-2 with Monday's loss to the Toronto Maple Leafs, but still sit first in the Metropolitan Division with 26 points this season.